Whether you're roughing it in a tent, or taking it easy in a RV/camper, you can find the perfect spot for camping in and around the scenic Lanesboro area. Cyclists, water enthusiasts, fisherman and hunters enjoy the natural beauty of the area, the Root River, and the 60-mile paved bike trail. 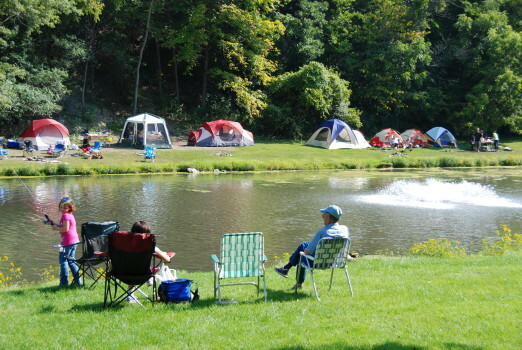 Lanesboro has two City Campgrounds which are available on a first-come, first-served basis. Sylvan Park Campground is directly behind the park near the ponds. Riverview Campground is located between the football field and hydropower waterfall dam. The campgrounds consist of camper sites and tent sites. Several privately-owned campgrounds offer riverfront tent sites, full hookups, picnic areas, private canoe launch, and other amenities onsite like a swimming pool, restaurant and golf course. Come, relax and enjoy the beautiful Root River Valley!